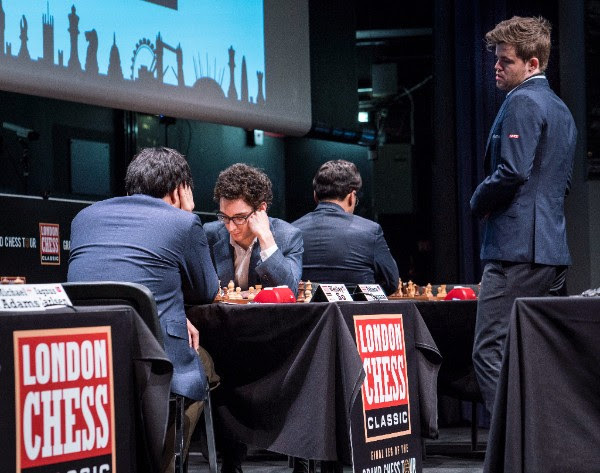 Round seven of the London Chess Classic was the most eventful one with three decisive results, which affected both the standings for this event and the entire tour. 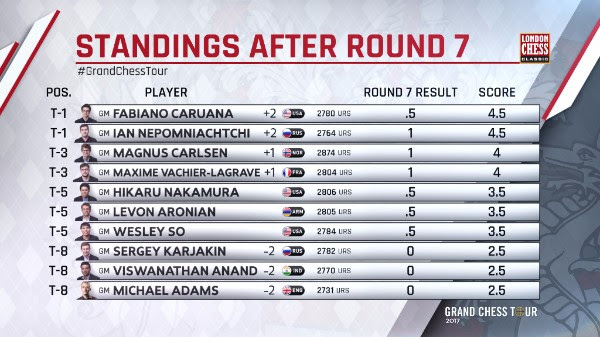 Ian Nepomniachtchi won his second consecutive game and is now tied with Caruana who only drew today. 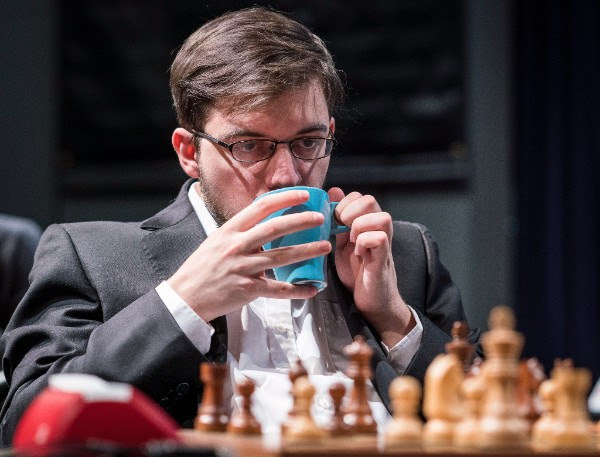 Maxime Vachier-Lagrave and Magnus Carlsen are neck and neck battling it out for the Grand Chess Tour overall title and both scored a much-needed point today. They are now half a point behind the leaders. 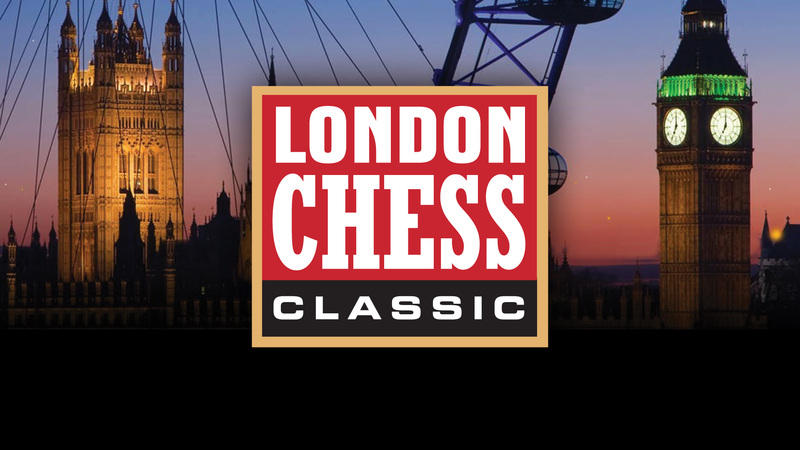 Ian Nepomniachtchi has the fate of the London Chess Classic and the entire tour in his hands as he plays Carlsen and Vachier-Lagrave in the next two games. Anand repeated the line Karjakin played against him yesterday which gave the Russian equality out of the opening. Nepomniachtchi decided not to repeat the same line and played a pawn sacrifice opening a file on his opponent’s king but leaving his own king in the center. Anand sacrificed the pawn back for dynamic play making the position very complicated. Nepomniachtchi found a repetition in a position but decided to play for a win since there have been so many draws via threefold repetition in the tournament already. His efforts paid off when the former World Champion played a few imprecise moves then blundered in an already difficult position. Karjakin decided to enter a theoretical battle by challenging the Frenchman’s beloved Najdorf in one of the sharpest variations. Karjakin felt that he was well prepared but in fact had underestimated his opponent’s position as Vachier-Lagrave had outposts for all his pieces. The middlegame was extremely complicated, which was simply better handled by Vachier-Lagrave who has a great understanding of these structures. After exchanging the queens, the Frenchman was able to utilize his superior pawn structure to win a pawn. Feeling that his opponent has played well the entire game and won’t blunder, Karjakin decided to end the suffering and resigned. The World Champion surprised everyone by starting the game with the rare 1.f4, known as the Bird’s Opening. Today, he was on the receiving end of a positional sacrifice and was in a bad position after 14 moves. Instead of playing for the long-term compensation, Adams was too impatient in simplifying the position to get the material back. 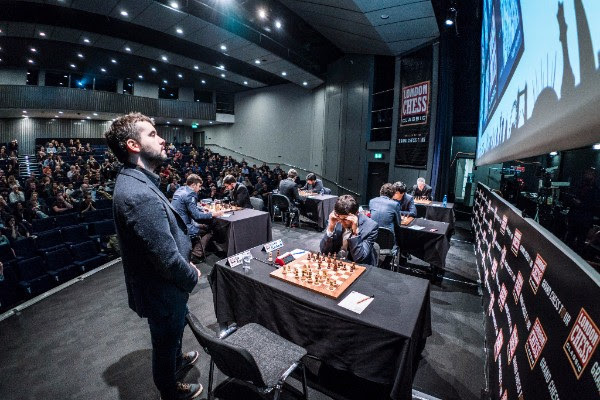 The resulting endgame was still unclear, but Adams started to slowly lose the thread of the game and allowed Carlsen to mobilize his pieces. After an accumulation of several small mistakes, Adams blundered in an already bad position. 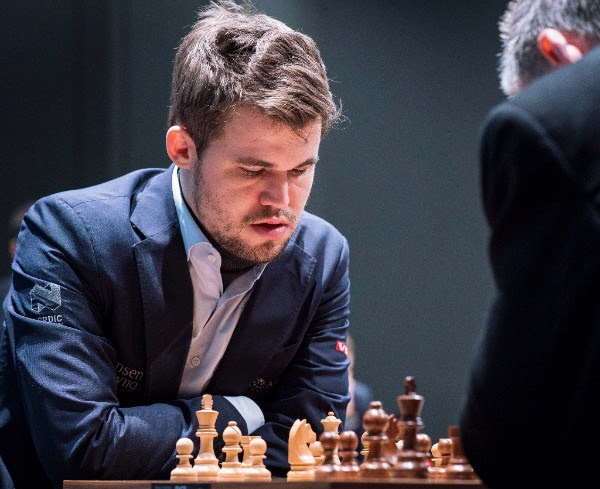 Even though Carlsen felt like he hasn’t been playing well and has been miscalculating, he still has been fighting for every point in this tournament. Caruana was surprised by his compatriot’s opening of choice of playing a6 on the third move instead of the Berlin in the Spanish Opening. Having the white pieces, he wanted to get a game and press for the win, thus his choice to avoid the main lines. After the central pawns were exchanged, the resulting position was too equal for White to create any real chances. Draw was agreed when the 30-move requirement was reached. The four-time US Champion did not get the birthday gift he was hoping for today. 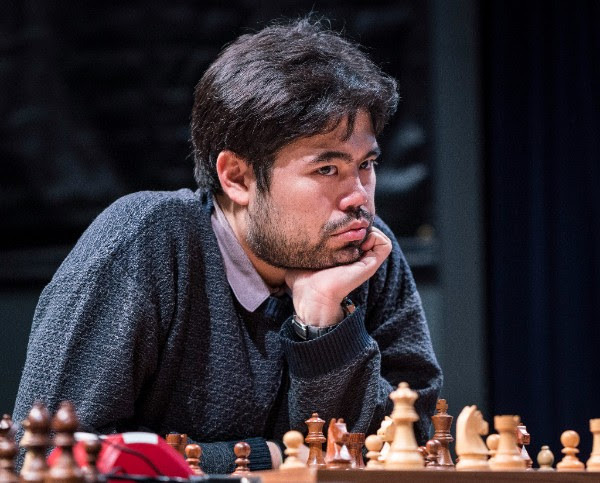 After 20 moves of theory were blitzed out, Nakamura went into a deep think. Aronian had a slight edge with his more active pieces but was unable to put enough pressure on his opponent to achieve anything significant. Nakamura weakened his king’s position in order to exchange his opponent’s active knight, but due to reduced material on the board, his defense was not difficult.